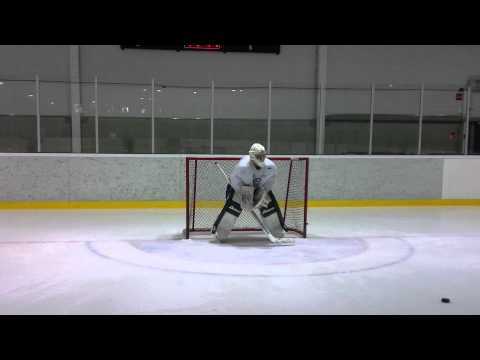 This video was shot a few weeks ago at our pro goalies summer ice training session. By this time we had been on the ice for about a month and were moving more towards drills like this after the main technical corrections etc were done. In this example video Ari Sulander stops first the shot from narrow angle and right after that he moves to save the quick breakaway coming from the center. In the first shot the aim is to stay patient and not to back too deep in & work on timing. Key is to avoid committing & going down too early. This is just one example of the combination drills we did use this summer and before you start using drills like this remember one thing: Your technique needs to be correct before you move on to applied drills like this. This goes along as guideline for juniors as well as seasoned pro’s. Olemme Suomen johtava maalivahtien valmennukseen ja varusteisiin erikoistunut yritys. Tavoitteemme on tarjota parhaat mahdolliset resurssit ilmaiseksi kaikille maalivahdeille ja maalivahtivalmentajille. Ostamalla tuotteita verkkokaupastamme tuet toimintaamme ja mahdollistat ilmaiset resurssit sivustollamme. ©2019 GoaliePro.com - From Goalies For Goalies.